Are You the Right Owner for a Bullmastiff? This is my point of view about Bullmastiff ownership. The original purpose of the breed was to assist the Gamekeeper while both the Gamekeeper and the Bullmastiff hunted down poachers together. The Bullmastiff was bred to be a ferocious guard dog and personal companion to the Gamekeeper as well as obey and protect his master and property. In modern times, the Bullmastiff’s temperament has been toned down and protection from poachers is virtually a thing of the past. Therefore, the main purpose of the Bullmastiff has changed to become a protective, personal companion for the family and home. The Bullmastiff escorts the family members wherever they go and makes sure all is sound and safe for his/her’s family – even if it is just to the bathroom. Now, if your Bullmastiff is locked outside in the backyard or pen or chained to a tree – what purpose did you have in getting a Bullmastiff in the first place? If a Bullmastiff is locked outside what are they protecting for you – your nice backyard lawn, the water fountain, the shed with that nifty riding lawn mower? Or do you seriously think that a Bullmastiff stuck outside is going to be enough to deter a criminal from causing personal harm to you inside of the house? Not likely. The Bullmastiff might bark and wake up your neighbors who will just get annoyed and call the pound. If by chance, one neighbor did call the police about a “barking dog”, by the time the cops got there you would most likely be dead – or wish that you were. Here is another problem with keeping a Bullmastiff outside. This breed is very sensitive to weather. A heat stroke can happen easily at a mild 80 degrees in the spring/summer or they can easily freeze to death in the winter. They are very receptive to contracting mange and other nasty skin infections that humans can also catch (yes, that means if your children pet your mange infested Bullmastiff – they will get mange also and spread the bacteria all over the house). If you still have any doubts, take a look at the photos included in this document of owners who thought keeping a Bullmastiff as an outside dog was a cool idea. So here is a reality check. If you want a Bullmastiff as an outside dog because having one would look good for your landscape, then consider just purchasing a statue of a Bullmastiff instead. A statue does not have to be fed, there are no vet bills, and your neighbors won’t complain about the barking. It will also look quite nice and probably run about the same price as buying a real Bullmastiff puppy. If you want a Bullmastiff as an extension of your ego, consider investing the money you would have spent on a puppy and hire a psychiatrist instead to discuss your low self-esteem problems. All of the beautiful Bullmastiffs that you have visited or seen look that way because the owners care enough to properly house, feed, and love their Bullmastiff. All of the Bullmastiffs you have interacted with that were friendly and kind are that way because the owners went through the agony of training these stubborn creatures to become livable companions through their puppy and adolescent years. Will you provide proper housing, food, and companionship for your Bullmastiff? Do you have the patience and money to train and repair the damage to your house after acquiring a Bullmastiff? Before you acquire a Bullmastiff into your household – ask yourself why you really want this dog and for what reason. A Bullmastiff is not bred to be a landscape fixture, a toy for your child, or a pet for your existing pet – it is bred to be a personal, in-home companion for adults. Is that what you are truly looking for? 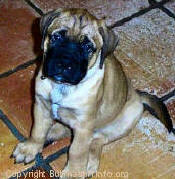 The first Bullmastiff puppy pictured was contributed by Beloved Toad Bullmastiffs, Phil and Karen Burke, from their Fall 2001 litter. This pup is healthy, happy, and ready to be a loving, in-home companion to the right owner. The second Bullmastiff pictured covered with mange is Buford. Buford was rescued by Mickey Mullen of Florida Bullmastiff Rescue. Buford that was kept by a guy who thought having a Bullmastiff would raise his ego and social status. Only problem was, he forgot that he actually had to feed him, give him shelter, and provide vet care. Buford was kept as an outside dog and is covered with mange. The second and third Bullmastiffs pictured are Elizabeth and Mel. Although well fed, they were also kept as outside breeding dogs and are covered with mange due to the outside elements and neglect for proper housing by the owner. They were also rescued by Mickey Mullen of Florida Bullmastiff Rescue. The beautiful Red Bullmastiff pictured is Barney. Also known as CH. D'Lites Sedentary Devil, Barney was bred by Lisa Lane and owned by Ed and Kathy McAlister. His picture was contributed by Linda Thompson of Gemstone Bullmastiffs and Kathy McAlister. Barney is properly kept as an inside companion - hence the reason he looks so gorgeous!